They are adorable -- I'm so happy for you!! They are so cute! They look like a perfect pair! Too cute, and you are full of freaking suprises lately!! That is a great compromise instead of getting a kitten! Soooo cute! Glad you're happy! They are precious!! Love the pics of them! Awe! They are too cute! After reading your post about your kitty, I'm SO glad you decided to get more kitties! And, in case you're still worried, I wanted to tell you that, while I was pregnant with my daughter, I worked full time at a veterinary hospital and also had two of my own cats. I was cautious but the doctors that I worked with pretty much just said "keep your mouth shut while handling the poo." 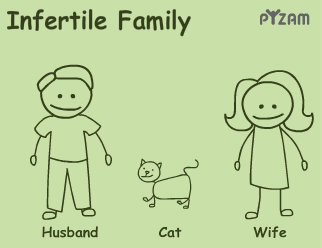 LOL :) Pretty much a given - but I wanted to let you know that I made it thru all 9 months and contact with millions (maybe not quite that many...) of cats and my daughter and I both came out wonderfully. :) Wishing you a happy rest of your pregnancy!!! Very sweet. It's tough to visit the shelter without wanting to adopt something :). I'm glad to hear these two will have a loving home. Fun!!! I so miss my cat, my DH had a yellow lab when we got together - so I had to leave the cat with my ex. Now we have a yellow lab and a shitzu...but I will always be a cat person! I was wondering when you were going to get cats! They are completely adorable! I am so glad that you adopted both of them, and that you got older kittens. It is great to see that the sisters get to stay together. Congratulations!